One of the big surprises in the last Christie’s sale was the Yaka figure illustrated below (info). While one could easily have overlooked this lot in the auction catalogue, this big and exceptionally strongly carved statue just owned the preview room it was presented in. Mario Fantin was a mountaineer – collector – researcher. He made a lot of trips to Asia and was the first to succesfully climb the K2 in the Himalaya. He traveled 20 times to Africa and wrote a book about Ivory Coast. This statue was exhibited in 1973 in Galerie Pro Arte in Bologna and was illustrated on the exhibition’s poster. In 1983, after the death of Mario Fantin, this statue was acquired by Paolo Morigi. I was wondering if anyone recognizes this label ? Surely, it can’t be the only one of this type. Also, I haven’t been able to track down this ‘Pro Arte’ gallery (which apparently was active in Bologna in 1973). If anyone would have an idea of that exhibition poster, that would be great too. 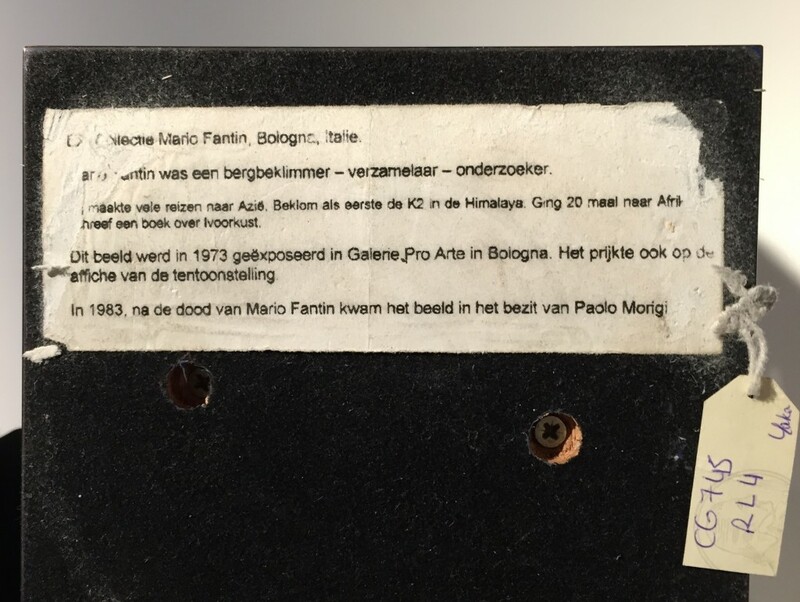 Prove that Morigi indeed acquired a lot of objects from the Fantin collection can be found in the auction catalogue of the Morigi collection (Sotheby’s, Paris, “Collection Paolo Morigi”, 6 June 2005. ): lot 20, 41, 57, 64, 77, 78, 79, 112, 122 and 123 all came from Fantin – so that part of the story is plausible. Fingers crossed somebody knows more ! UPDATE: Beppe Berna, who runs an African art gallery in Bologna, was so kind to do some research. He checked the yearbooks of the local association of galleries (of which he has been president) of those years and could find no trace of a gallery with the name ‘Pro Arte’. Berna was able to trace three ‘Pro Arte’ galleries: in 1973 there was one in Morges (Switzerland) and one in Mexico City and in 1987 one in Lugano (Switzerland). Strange ! This entry was posted in Research and tagged Suku, Yaka on July 21, 2015 by admin. If you are in Brussels for BRUNEAF, don’t forget to visit “Giant Masks from the Congo” (info). It’s only a 3 minute walk from the Sablon (Place des Palais 7), and highly recommended (& free!). It’s an exhibition only the Tervuren museum could accomplish – showing for example half of the existing Suku kakungu masks: very impressive to say the least ! A small catalogue, written by Julien Volper, is available in Dutch, French and English. This entry was posted in Exhibtions, News and tagged Suku, Yaka on June 10, 2015 by admin. 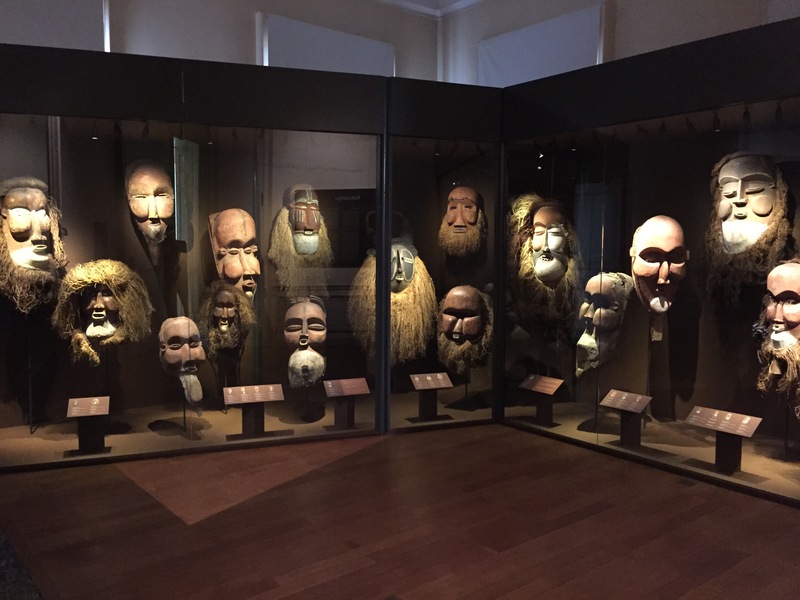 From Friday 15 May to Wednesday 2 September 2015, the Brussels Belvue Museum (5 minutes walking from the Sablon) will be hosting the exhibition Giant Masks from the Congo – A Belgian Jesuit ethnographic heritage (info). 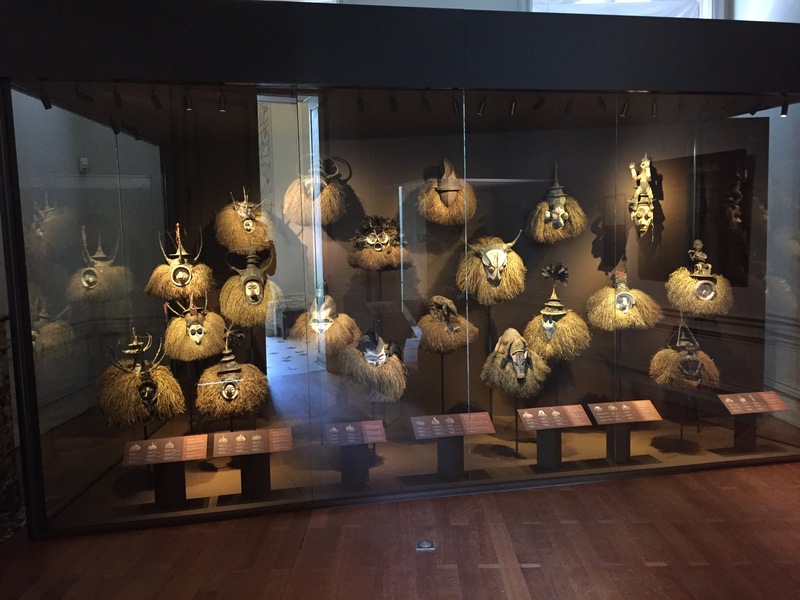 It is a collaboration of the Royal Museum of Central Africa, the Belgian Society of Jesus, BELvue Museum, and the King Baudouin Foundation and will show a series of (“giant”) Yaka and Suku masks used during initiation rituals. Objects from the Heverlee missionary collections are complemented with masks and statues from the collections of Tervuren. A catalogue will accompany the exhibition and the entrance will be free. While working in the Belgian Congo, Jesuit missionaries also carried out ethnographic research and collected objects. The historical and cultural context of this endeavour introduces this exhibit, which features a set of masks used during the mukanda male initiation rite among the Yaka and the Suku. These masks are remarkable in their exceptional form and design. Most of these pieces have never before been seen in public or in print. The first part of the exhibit describes the work of the Jesuits in the Kwango mission and provides the portrait of several Jesuit collectors. A wealth of documents – handwritten letters, published excerpts, maps – sketches out the context in which pieces were collected and the collaboration that began in the 1930s between the museum and the Jesuits. The RMCA holds the large collection from the former Jesuit missionary museum in Heverlee in trust and is in charge of its conservation, archiving, restoration, and scientific analysis. The second part presents the mukanda rite among the Yaka and Suku, as well as a few neighbouring groups. 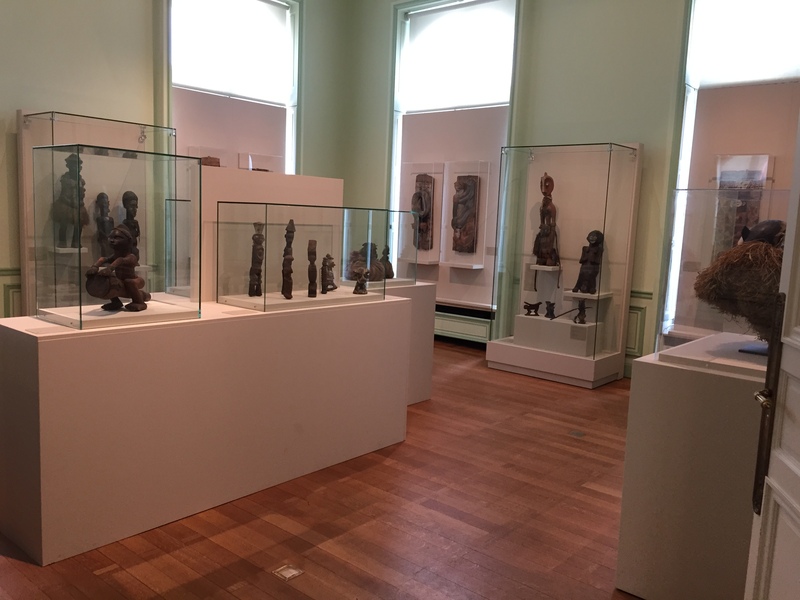 In 2013, the Belvue Museum hosted another exhibition (Dr Livingstone, I presume) that showed African art – you can find pictures of it on the blog of François Boulanger here. This entry was posted in Exhibtions, News and tagged Suku, Yaka on February 21, 2015 by admin. A new interactive website displaying an interesting collection of both old and new African combs: Origins of the Afro Comb; a shared project between the Fitzwilliam Museum and the Museum of Archaeology and Anthropology in Cambridge, and The Petrie Museum of Egyptian Archaeology in London. This project is multi-disciplinary and will combine new archaeological, anthropological and sociological research with community engagement. It will trace over 5000 years of history of the African comb from the Pre-dynastic period of Egypt to the Twentieth century in UK and US, and will include oral histories and personal testimonies that will document attitudes towards hair and grooming in the present day. Hair and grooming have always played an important role in the culture of Africa and the African Diaspora and the traditional African comb, known also as an African pick, rake, or ‘Afro’ has played a crucial role in the creation, maintenance, and decoration of hair-styles. 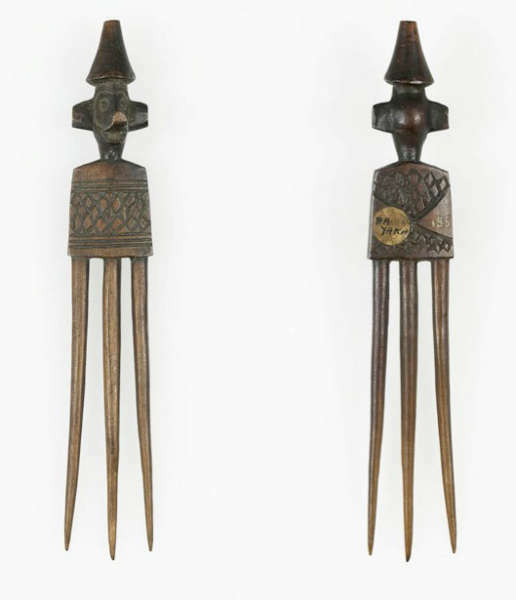 Furthermore, the African comb has been used by both men and women, and continues to be relevant to both groups in the present day. Makes me remember my late grandfather, who wouldn’t leave the house without his comb in the inside pocket of his jacket – not that he had much hair. This entry was posted in Exhibtions, News and tagged Yaka on July 28, 2013 by admin.